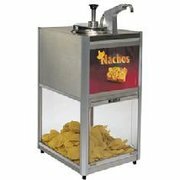 Description: Enjoy the many smiles when everyone knows you have a Nacho machine. We include an aluminum scoop for easy serving. Requirements: You will need a table or counter to set the Nachos machine on while in use.